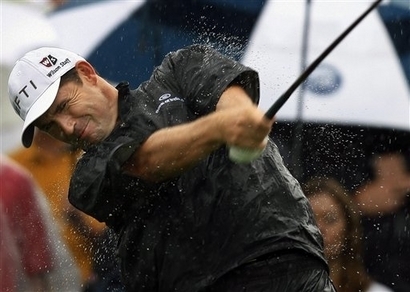 Top gun Padraig Harrington is leaner, meaner and more dangerous than ever. But the bad news for his rivals is that the sensational final round 64 that lit up the 3 Irish Open was only a taste of what’s to come. 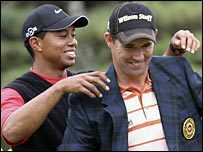 Targeting Major No 4 at Whistling Straits next week, Harrington revealed that he can play even better if he gets his mental game in perfect shape. Harrington said: “The only area that I am more focussed on at the moment is my mental side; my good and bad shots are both coming from my focus. “I just have to be a little tighter all the time and trust it a bit more. I know these are all clichés, but it is part of trusting it and accepting it and just easing up a little bit and letting it happen. The Dubliner, 38, is just one decent finish away from securing his Ryder Cup place after moving to 10th in the race for nine automatic places. Happy with his short game and gaining in confidence with the driver, he’ll still be tested to the limit at a track where he took a nightmare triple bogey eight at the 70th hole last year and hand the title to Tiger Woods. Harrington said: “It’s a tough course, Akron. The fairways are the narrowest you get in the US all year. “It’s a course where you’ve got to pay attention all the time. It has very, very fast greens and it’s a tough test. Rory McIlroy can’t wait to get back to Akron after a disappointing weekend in the Irish Open in Killarney. He said: “Akron is a fantastic golf course. If I can go there with a good frame of mind, hopefully I can have a good week. McIlroy struggled to focus at the Irish Open but reckons he can hit top form over the next two weeks. He said: “I definitely find it easier to focus for the big events. So I don’t think I’ll have any problem with trying to get up for these next two events. “If I can keep playing the way I am, and probably need to do a bit of work with Michael Bannon tomorrow and just straighten up a couple of things. US Open champion McDowell is frustrated that he’s finding it tough to get refocussed after his major win. But he believes he will be close to his best this week and ready to go in the US PGA. He said: “I’s been much more difficult than I ever imagined, but every week I’m feeling better and better.